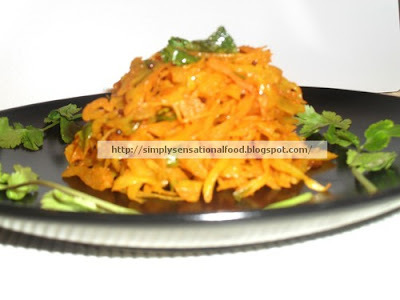 Cabbage sabji (dry)- A simple vegetarian side dish accompaniment made from shredded cabbage stir fried in simple spices. An un complicated dish easy to make but delicious in taste. 1 medium tomato chopped and blended to pulp. 1/2 tablespoon chopped coriander for garnish. 1.Heat the oil and add the mustard seeds. 3.Add all the spices . Saute till spices blend in with tomatoes 2-3 minutes. 4.Add the cabbage and stir fry. 5.Cover and cook till cabbage is tender but still slightly crisp. 6.Transfer to serving dish.Garnish with coriander. First time here,nice blog,sabji looks great,love the way u have cut the cabbage,awesome! hey thanks for stopping by..you have a wonderful space too!!! 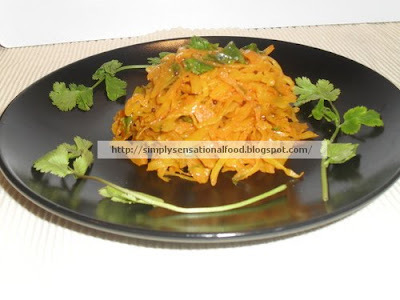 Awesome clicks...easy and yummy sabji..
Nice presentation and cabbage subzi looks simply delicious.